Jimoh Ovbiagele, a co-founder of San Francisco-based ROSS Intelligence, proudly sports a “Home is Toronto” sticker on his laptop. It’s not some patriotic shout-out to his Canadian birthplace (he grew up in Texas), nor is it purely a nostalgic nod to his days studying computer science at the University of Toronto, where the artificial intelligence-powered legal research startup was conceived. Rather, it’s a reminder of where ROSS believes it needs to be in order to successfully disrupt the $8.4-billion legal search industry. To that end, Ovbiagele will be at U of T's Bahen Centre for Information Technology next week for the official launch of ROSS North, the startup’s new Toronto-based R&D lab. He will be joined by fellow co-founder and ROSS CEO Andrew Arruda, as well as Toronto Mayor John Tory and U of T President Meric Gertler. ROSS’s homecoming is yet another sign of Toronto’s – and U of T’s – emergence as a hub for groundbreaking AI research, particularly in the deep learning field. Deep learning tries to replicate the way humans learn to identify, for example, unfamiliar objects in their environments without explicit instructions, similar to how a child learns to identify a dog without being specifically told to look for a lolling tongue, wet nose and bad breath. Many businesses are betting such techniques hold the keys to the next big technology revolution. In ROSS’s case, AI tools allow lawyers to search vast legal databases more quickly and efficiently by employing natural language recognition technologies. Among its growing list of customers is Denton’s, the world’s largest law firm. Other startups, meantime, are using AI for everything from improving the accuracy of medical diagnoses to supercharging companies’ marketing efforts. Ovbiagele says recent government efforts to bolster Toronto’s status as an emerging hub for AI-related research – including the recent Vector Institute that was launched in partnership with U of T – have served to make Canada’s biggest city even more attractive to technology firms. The most recent example is ride-sharing giant Uber recently announcing a plan to set up a driverless car R&D lab in Toronto to be headed by U of T's Raquel Urtasun, an associate professor of computer science and a Vector co-founder. Toronto is also receiving some unintentional help from U.S. President Donald Trump. Ovbiagele, for one, recounts his recent efforts to hire a Chinese Google engineer who was working in the U.S. on a visa. The paperwork was all drafted when the engineer suddenly bolted for Canada in the wake of Trump’s executive order banning immigration from six Muslim-majority countries. “Now we’re going to try to get her back,” he says. While ROSS North is temporarily located off of Yonge-Dundas Square, Ovbiagele says the permanent space will almost certainly be downtown and close to the U of T campus, where ROSS got its start back in 2014. That was when Ovbiagele, Arruda and fellow computer science student Pargles Dall’Oglio entered a course-based IBM competition that sought novel applications for its Watson cognitive computing platform – the same computer that famously won Jeopardy. Their idea: create an AI tool that reads vast legal databases the same way a lawyer would, learning as it goes. ROSS’s natural language technology also allows lawyers to do away with cumbersome Boolean search queries based on key words, speeding up the process. Interestingly, one of the panel judges during the U of T portion of competition was Benjamin Alarie, a professor at U of T’s Faculty of Law. Inspired by the entries, Alarie ended up participating with computer science students in another AI-focused legal startup called Blue J Legal, which uses similar technologies to help lawyers research tax law cases and even predict judicial rulings. 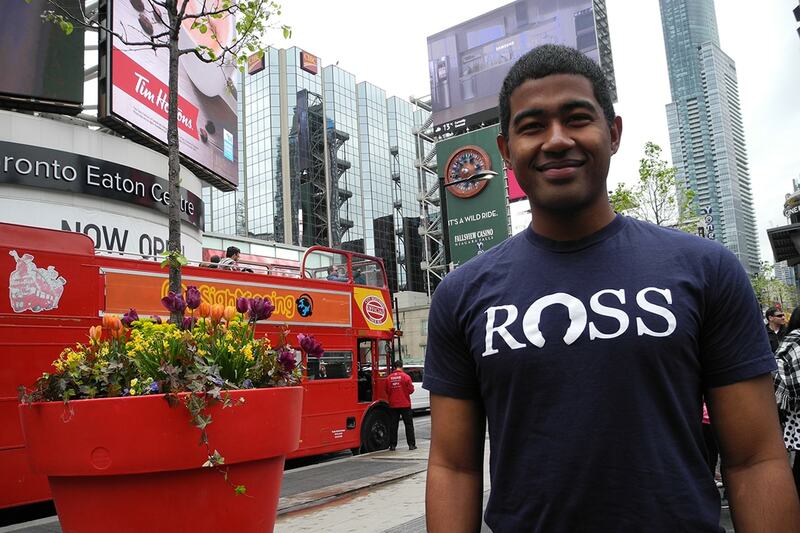 ROSS ended up taking second in the wider IBM competition and later relocated to Silicon Valley to participate in the prestigious Y Combinator accelerator program. The move was also intended to position ROSS closer to its intended customer base. As Ovbiagele points out, there are more lawyers in the Golden States than in all of Canada. Though ROSS initially launched with a focus on U.S. bankruptcy law, Arruda says the company’s upcoming product lines – the ones to be developed in Toronto – will be ultimately applicable to any area of the law, including in Canada. The market for such a tool is potentially huge, spanning both giant law firm’s like Denton’s to small practices with a handful of lawyers. Indeed, a Deloitte survey of law firms and in-house counsel last year found that more than half of respondents expected technology solutions to replace the work of lawyers within the next five years. While some critics fret about triggering a wave of unemployed lawyers, Arruda argues a more likely outcome is an overall reduction in the cost of legal services and a corresponding spike in demand. “Whereas in other industries like transportation you see self-driving trucks is going to lead to a lot of big [employment] issues people will need to address, the law doesn’t suffer from that problem because roughly 80 per cent of the people who need legal advice can’t afford it at the current rates,” he says. Whatever transpires, one thing is certain: AI-enabled tools like ROSS are poised to shake up the legal industry and existing players like LexisNexis and Thomson Reuters shouldn’t be expected to cede their market shares without a fight. All of which underscores the need for ROSS, which Ovbiagele compares to a nimble speedboat in an industry currently dominated by giant ocean-going freighters, to be as close as possible to the best minds in the fast-moving field of AI research.